Brazil’s Lucas Esper Berthoud rises above all other competitors with his Mardu Vehicles deck, winning $50,000, the invitation to the 2017 Magic World Championship, and the title of Pro Tour Aether Revolt champion! Pro Tour Aether Revolt will be remembered for many things, among those the explosion of Mardu Vehicles, the power of the Heart of Kiran, and the dominance of the original DEX Army. Going into this event, the Latin American contingency of three teams—DEX Army, Ligamagic, and DEXThird—represented the crew of players that formed under Pro Tour Hall of Famer Willy Edel, the godfather of Latin American Magic. DEXThird was, looking at their numbers, a team of Pro Tour hopefuls looking to prove themselves among their veteran testing partners from the other two teams. Among those in DEXThird was Lucas Esper Berthoud, a long-time Brazilian player that was competing in his sixth Pro Tour this weekend. It was in this sixth tournament that he saw his rise to the elite over three days, and in it he has learned to keep a calm head through a roller coaster of emotion and tough plays, leading into a match that clinched his Top 8 berth in the final round of swiss. He was joined by friend and testing partner Márcio Carvalho in the top two spots at the end of Saturday, and the two would meet to battle against each other in the finals of the Pro Tour, representing an all-DEX finals as their Mardu Vehicle decks clashed against each other. There, Berthoud and Carvalho traded blows two games apiece, until Berthoud ultimately took down his testing partner 3-2 to clinch a trophy and the $50,000 that comes with it in his very first Pro Tour Top 8. Congratulations to Lucas Esper Berthoud on a tremendous weekend, and to the Latin Magic community on a Pro Tour to truly remember. The Top 8 of Pro Tour Aether Revolt features a fantastic lineup of players from all over the world, featuring many first-time faces and a few legendary ones. Leading off is Portugal’s Márcio Carvalho in his third Top 8, following his phenomenal start to the season at the 2016 Magic World Championship. Second is friend and testing partner Lucas Esper Berthoud, a Brazilian who earned his very first Pro Tour Top 8. In third seed is Liu Yuchen, a long-time veteran from China with five Grand Prix Top 8s, also in his first Pro Tour Sunday stage appearance. Berthoud and Liu are joined by the USA’s Donald Smith and the Czech Republic’s Jan Ksandr in their first Sunday showing. The final three spots on Sunday belong to seasoned veterans. Martin Jůza, the Czech Republic’s most decorated player, earned his third Pro Tour Top 8 this weekend. He is joined by Canada’s Eduardo Sajgalik in his second Pro Tour Top 8. Finally, Pro Tour Hall of Famer Paulo Vitor Damo da Rosa rounds out the players you’ll see in Sunday’s elimination matches in a historic eleventh Pro Tour Top 8. Which one of these players will win the Pro Tour, the $50,000 first place prize, and the invitation to the 2017 Magic: The Gathering World Championship? Tune in on Sunday at 9 a.m. local time (1 a.m. PT/4 a.m. ET/9 a.m. UTC) to find out! Panama’s César Segovia and China’s Liu Yuchen stand above the rest after eight rounds with undefeated records at Pro Tour Aether Revolt! The excellent start is big for both players. Segovia is making the most of his very first Pro Tour, an invitation he earned courtesy of Team Panama’s excellent performance in the 2016 World Magic Cup. For Liu, an 8-0 start has given him a good shot at adding an impressive Pro Tour showing to his name, something the five-time Grand Prix Top 8 competitor has been longing for. Will Segovia and Liu carry their performances through a stellar draft and series of Standard rounds on Day Two? Tune in to twitch.tv/magic on Saturday at 9 a.m. local time (1 a.m. PT/4 a.m. ET/9 a.m. UTC) to find out! Live video coverage of Pro Tour Aether Revolt takes place on twitch.tv/magic and begins February 3 at 9 a.m./0900 local time UTC. That’s 1 a.m. PT/4 a.m. ET. Pro Tour Aether Revolt: Meet Team Hotsauce Games? The hashtag for Pro Tour Aether Revolt is #PTAER. Join the conversation! 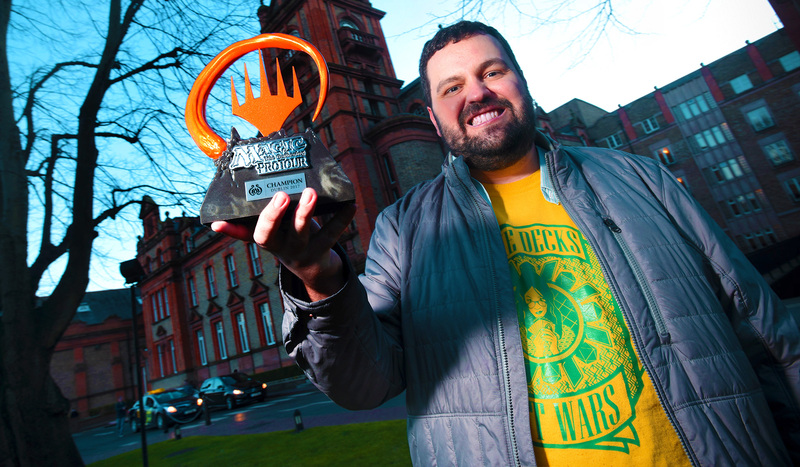 See the Pro Tour as it unravels on the Magic: The Gathering Facebook page! The Pro Tour Team Series is kicking off, and 32 teams are ready to give it their all at the next three Pro Tours! With the start of the Pro Tour Team Series, Pro Tour Aether Revolt marks the beginning of something wholly new!